Professionals at the go-to healthcare centre for residents in the Krachi East Municipality are unable to provide the needed services to patients because of lack of human resource and infrastructural challenges. The centre is in dire need of beds as patients sleep on benches while men, women and children share the same ward. The Dambai Health Centre, built years ago, is the only major health facility in the Krachi East Municipality. With only one medical doctor, the facility attends to about 200 patients daily. 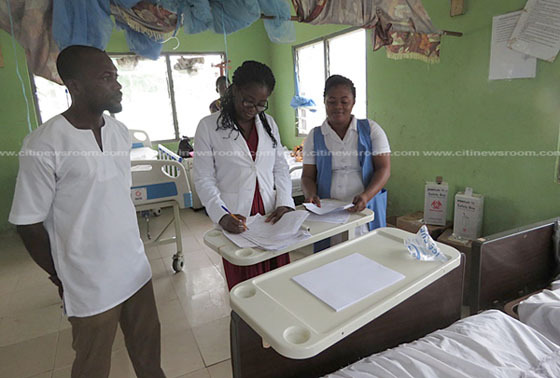 The medical officer at the facility, Dr. Abigail Amenu, in an interview with Citi News, said the management of the facility is a major headache. “We have only sixteen beds in this facility which is used by male, female and children. We don’t have a designated ward because of inadequate beds. At times when we have an overflow of patients, some have to sleep on benches,” Dr. Amenu revealed. Transferring patients to Worawora Government Hospital is a major challenge as the only ambulance of the facility has broken down for years. “All four vehicles of the facility, including an ambulance, two pick-ups and one 4×4 are all broken down. Patients who are referred to the Worawora Government Hospital have to be transported in public transport,” Dr. Amenu indicated. She commended the municipal assembly for helping the facility to find a solution to its water problem. Dr. Amenu, however, called for a bigger polytank to store enough water as the current polytank is too small. Apart from these challenges, the road leading to the facility is also in a deplorable state, especially during the rainy season.